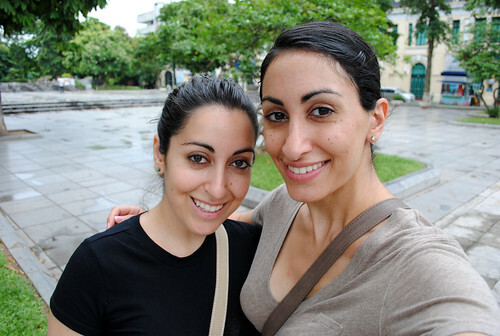 Ever since we’d arrived in Hanoi, Melody and I wanted to do some shopping beyond the Old Quarter. 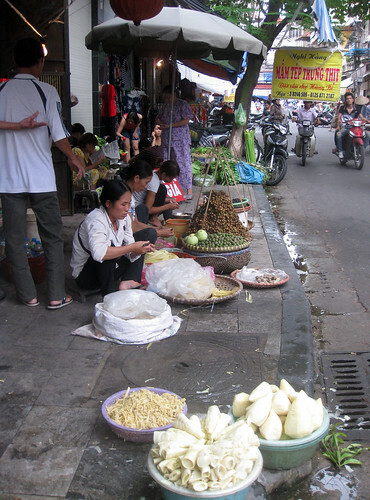 We’d heard there was great shopping to be had at the nearby Trang Tien plaza, so we set out on foot, only to find out once we arrived that the plaza had been closed for renovation. Undeterred, we spent our morning walking through the French Quarter, famous for its wide, tree-lined boulevards and eclectic French-Vietnamese architecture. 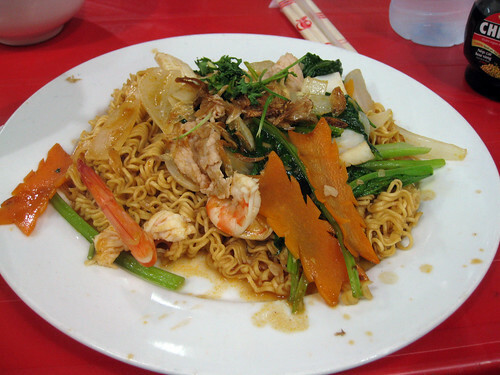 We were hungry for lunch, but after a less-than-palatable meal of fried vermicelli and crabmeat, we wandered back to Hoan Kiem Lake to grab a snack at Fanny Ice Cream. 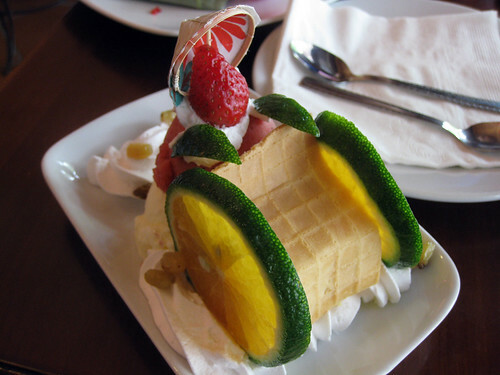 Fanny Ice Cream is a Hanoi specialty, with a twenty-page menu of every ice cream concoction you can imagine, be it tropical or traditional. Twenty pages of ice cream! Sounds like a kid’s dream, right? 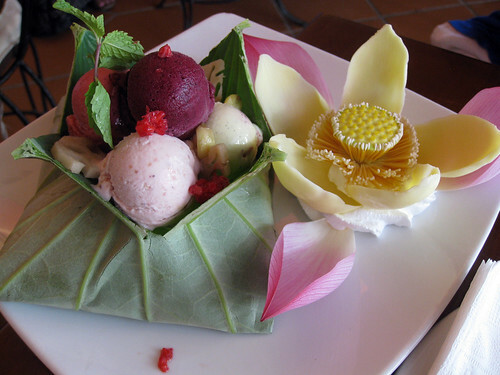 I ordered an ice cream cyclo, while Melody had the ice cream lotus. The ice cream flavors and gelato-like texture were top-notch and we had to stop ourselves from going back for dinner. Fanny is expensive ice cream, even by American standards (think five to ten dollars per item) but it remains among the best ice cream I’ve ever tasted. We spent the rest of the day taking it easy, stopping to grab a Vietnamese coffee or to do some shopping. 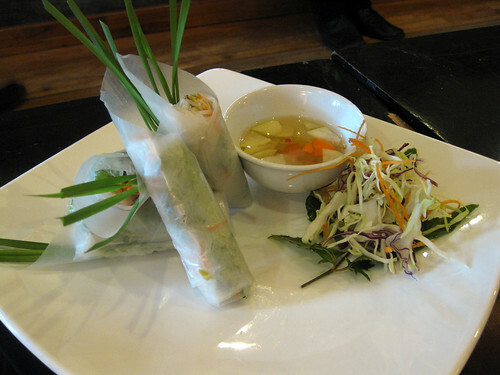 For dinner, at HanoiHanoi, an upscale restaurant near Tran Tien and Hoan Kiem Lake. 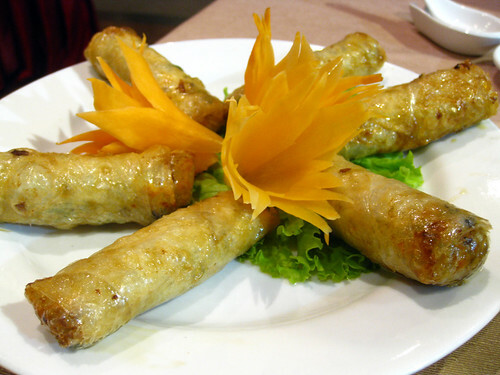 We started with the spring rolls, which were fresh and crispy, though I wasn’t crazy about the filling. The friendly staff showed us how to mix the variety of dipping sauces at our table so that we had the right proportion of salty to sweet, and sour to spicy. 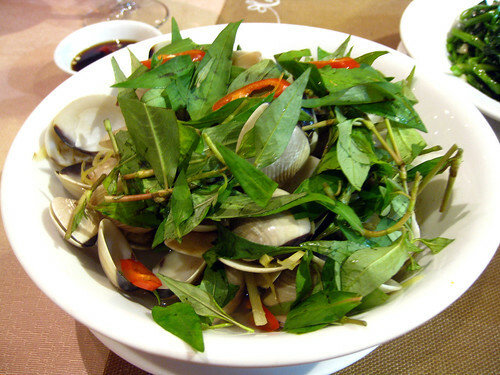 Next came the steamed clams with herbs, my favorite dish of the meal. I’m not sure what the mystery herbs were (Thai basil?) 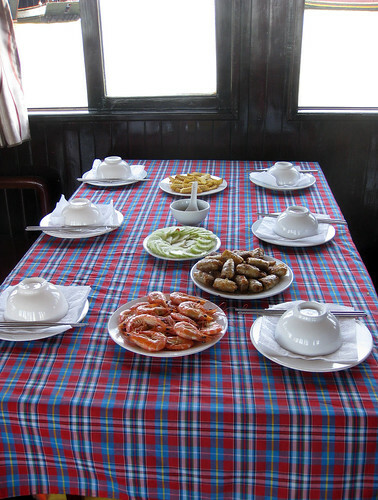 but they lent a terrific aroma to the briny clams, which I dipped in a tiny dish of salt and oil before eating atop a bowl of rice. 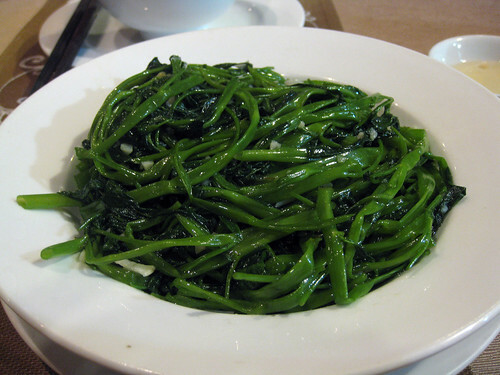 Lastly came our stir-fried water spinach with garlic, which was crunchy and super fresh. 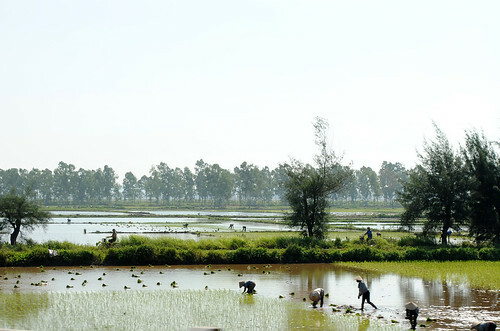 The long strands of water spinach, or ong choy, were fun to eat and best of all, healthy. We spent the rest of the evening lazily perusing the Old Quarter and avoiding the intermittent rain showers from an approaching tropical storm. Happily sated, we called it a night before the rainstorm kicked it up a notch. Do you like sweltering heat and unbearable humidity? 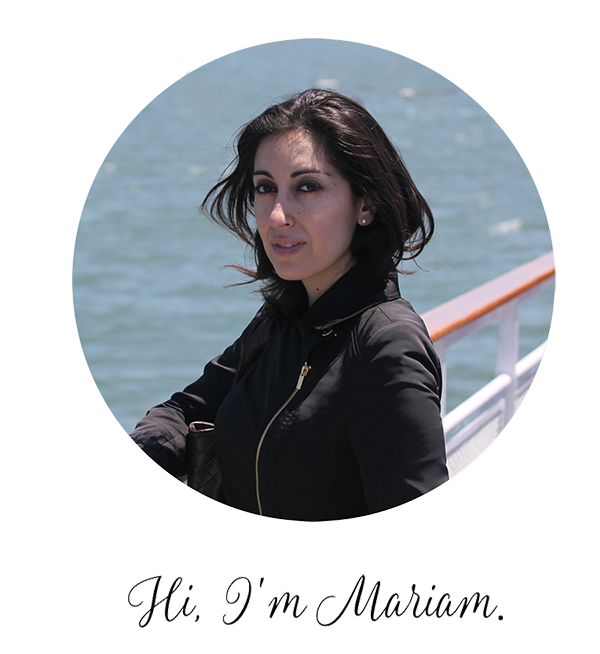 Do you enjoy vigorous physical activity in said sweltering heat and unbearable humidity? If so, I recommend hiking the Perfume Pagoda in late-July. It’ll bring out your inner masochist, I’m certain. 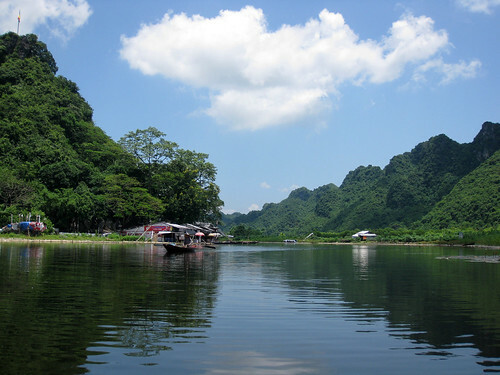 On our fourth day in Vietnam, Melody and I boarded a bus for a three-hour ride to the foot of the Huong Tich mountains. There, we purchased hats to protect us from the sun. (“You’ll regret it later if you don’t buy,” said our tour guide. He was right.) 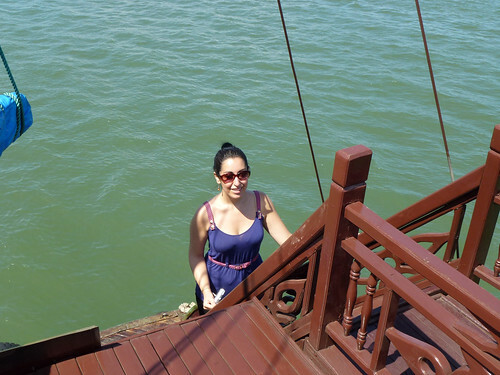 Afterwards, we boarded tiny steel boats on the Yen Vi river to take us to the Perfume Pagoda. The one-hour ride was both terrifying (the smallest move would send the boat precariously tipping from side to side) and gorgeous. We had lunch as soon as we arrived at the base of the Perfume Pagoda, at a spartan restaurant serving what can best be described as “prison fusion.” We loaded up on several bottles of water, and began our ascent. The many pagodas that make up the Perfume Pagoda are spread out among the limestone hills and tropical forests in the area of Huong Tich. 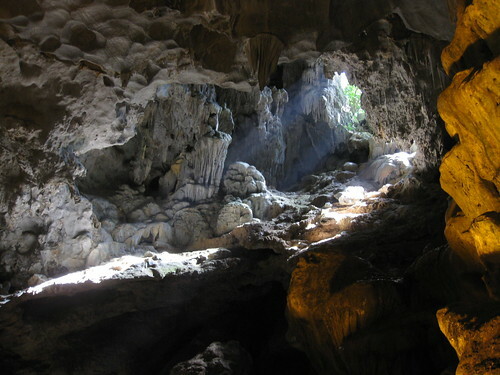 Legend claims that the site was discovered over 2,000 years ago by a monk meditating in the area, who named the site after a Tibetan mountain where the Buddha practiced asceticism. 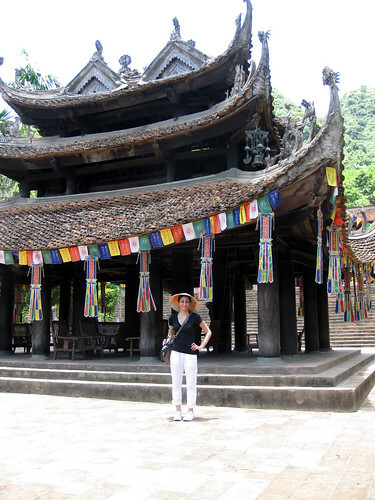 We spent some time exploring the colorful and eerily quiet Thien Tru Pagoda before continuing our hike. Now, I’m pretty certain that I have a high tolerance to heat, and even humidity, but this was unbearable. When I found out that a mountain cable car that takes you through a third of the hike was in operation that day, I wanted to hug everyone within reach. Everyone — even our tour guide, opted to take the car. The ride afforded us picturesque views, and a chance to catch our breath. 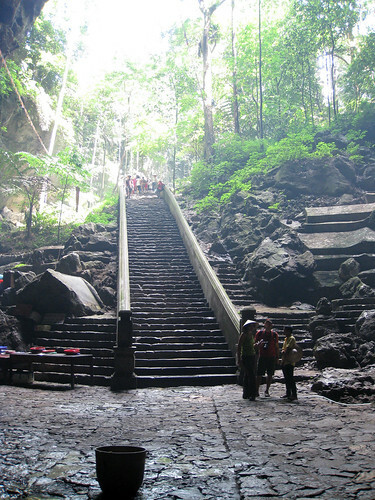 When we reached our destination, we continued our hike to Huong Tich Cave, or the center of the Perfume Pagoda. The cave was cool and dark, and a welcome respite. 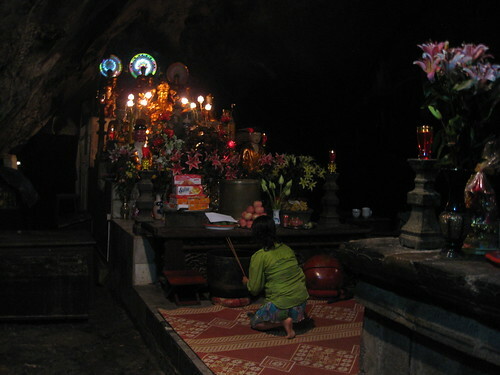 The cave is huge, and there are statues of deities, but many pilgrims come to get blessings from the limestone columns and dripstones, many of which are named and have special purposes like fertility and prosperity. We finished exploring the cave and slowly began our descent to the foot of the mountain, stopping often to admire the view, and, well, drink more water. The boat ride back down the Yen Vi River was a combined effort to not fall asleep and not go loopy from heatstroke. 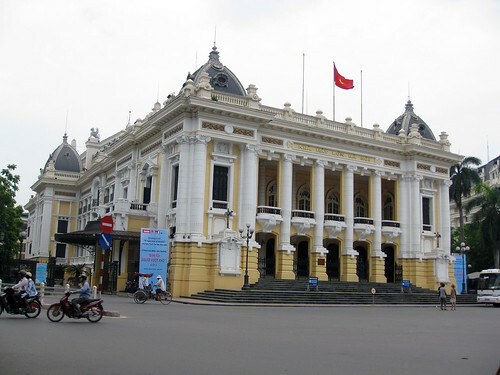 Back in Hanoi, we arrived at our hotel and passed out. Forget dinner, we just wanted to sleep. I imagine the Perfume Pagoda is more approachable in the winter, which explains why so few folks were there that day. But was it worth it? Absolutely. 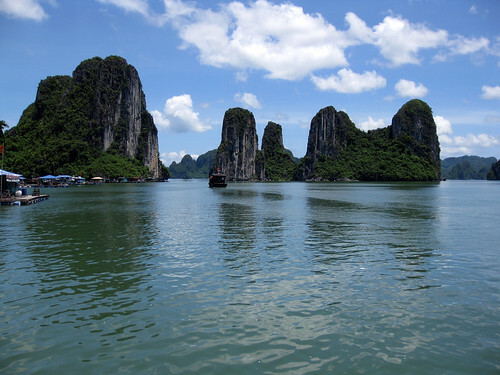 We woke up early on our third morning in Vietnam. Determined to beat the heat and humidity, my sister and I grabbed a taxi from the Old Quarter to the Temple of Literature in Hanoi, about a ten minute ride. Along the way, I made a mental note of the shops and food stalls I wanted to stop at on our walk back. 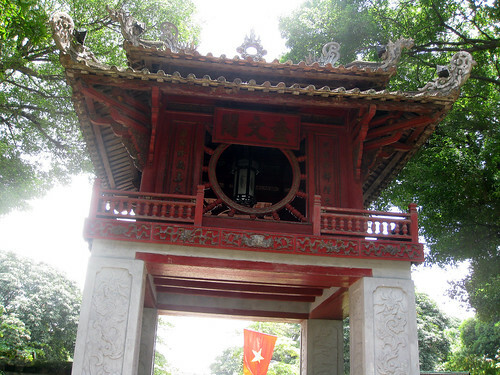 Constructed in 1070, the Temple of Literature was dedicated to Confucius and also houses the Imperial Academy, or what was Vietnam’s first university. Several (and I mean several) bottles of water later, we finished walking through the maze of courtyards that houses the temple’s lake, lush park, and high gates. 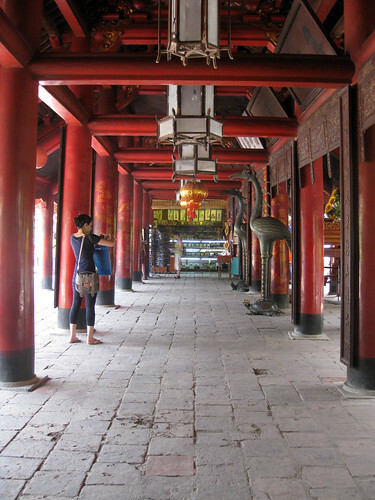 The temple is still used today for cultural events, and both Vietnamese and foreign tourists flanked the temple’s many gift shops selling souvenirs bearing the temple and Ho Chi Minh’s image. Afterwards, we stopped for lunch at KOTO, a nonprofit restaurant and vocational training program that trains disadvantaged youth in Vietnam. Every six months, KOTO takes around 25 young people off the streets. These trainees participate in a two-year program, and are provided with uniforms, meals, accommodation, medical care and a monthly training allowance. I remembered seeing KOTO featured on an episode of Anthony Bourdain’s No Reservations, so I was excited to visit. We sipped our watermelon juice alongside shrimp spring rolls that were served with creamy avocado and salty, pungent nuoc cham dipping sauce. 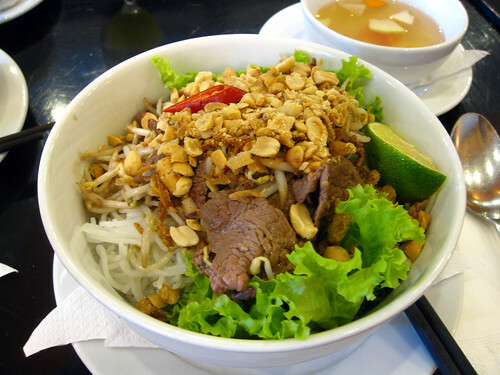 Next came our bun bo nam bo, or wok-fried beef on rice noodles with fresh mixed herbs, peanuts, lime, chili, and garlic. This was one of my favorite dishes that I ate during our trip — the beef was tender and juicy, and the flavors hit that perfect balance of salty-spicy-sweet-sour that I love so much. 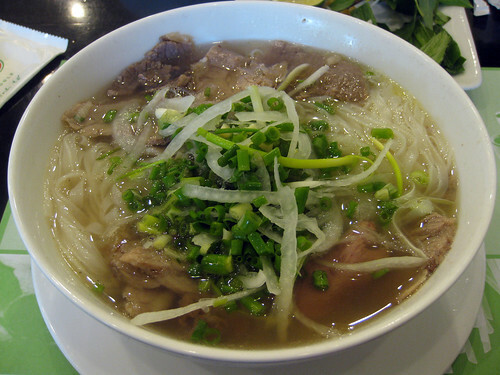 Fortified and cooled down, Melody and I spent the rest of the evening exploring Hanoi’s Old Quarter. For dinner, we took a taxi to Restaurant Bobby Chinn, another No Reservations-featured restaurant that I came to learn had since moved from the Hoan Kiem Lake neighborhood to the outskirts of Hanoi. It was a quiet evening at the restaurant, and the very dim lighting made so that it was difficult to see our meal (let along take photos). 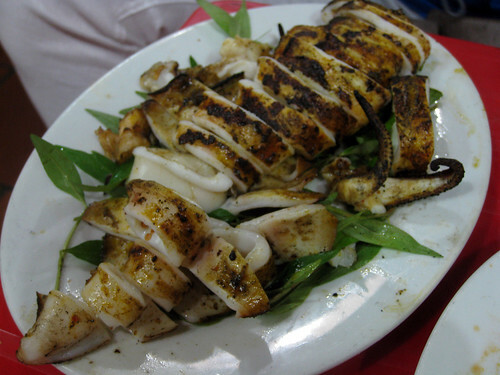 Service was attentive, and if you’re looking for a fusion-centric, high-end splurge of a meal in Hanoi and don’t mind driving a bit to get there, Restaurant Bobby Chinn is your place. We took a taxi back to the hotel after dinner, and called it yet another early night. The next morning we planned on heading to the Perfume Pagoda in the mountains, and we knew we’d need all the rest we could get.